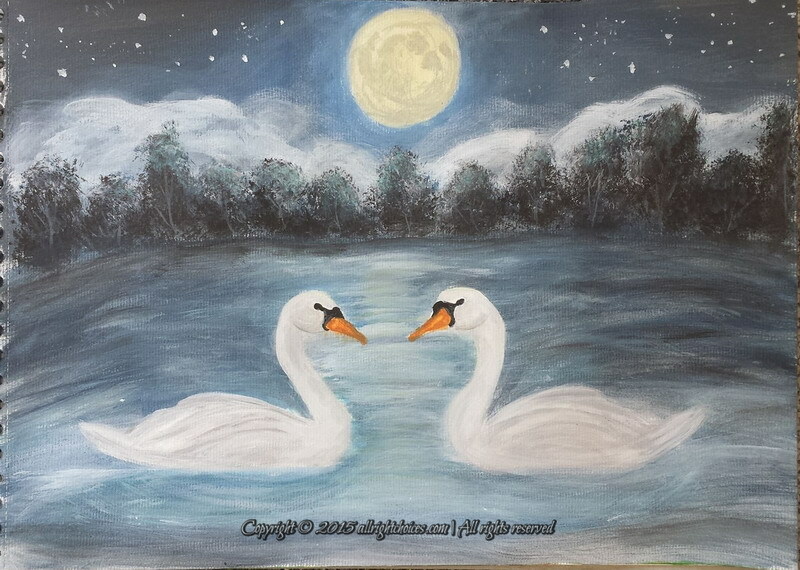 This entry was posted in Paintings and tagged acrylic, full moon, lake, night, night sky, painting, swan lake, swans by Lucy. Bookmark the permalink. I can see you were inspired by the blue moon 🙂 And I agree, it’s really romantic ! You did a great job ! It’s nice that you try to paint something different everyday 🙂 Good challenge ! What’s next ? what’s next ? :p I’m impatient !! Thank you so much! Now that you mentioned it, yes, it could just as well be snow 🙂 The moon is definitely my favorite though. Since the blue moon, I couldn’t wait to paint it. Have a lovely day! How interesting to watch this timelapse of your painting. Really great idea. Seems you found a new hobby! 🙂 Have fun! Thank you so much! It definitely is a lot of fun. I’m happy you enjoyed the time lapse video. I think it’s very neat to watch all my moves, once I’m done. Have a lovely day!